I’ve been working at camp for a few years, I’ve been in a leadership position for most of those years. And it has taken me a really long time to realize that I’ve been setting a terrible example for my staff. I’ve fairly recently realized this and I’ve been working on setting a better example for my camp colleagues these past few years, but the other day I witnessed a conversation that made me realize that I’m not the only one who’s setting a terrible example for up-and-coming staff, it’s rampant in the camping industry. People work at camp because they care, and almost every camp I know has the mantra “campers come first” which is wonderful, and as it should be. BUT (and that’s a big but), camper care shouldn’t come at the expense of staff health and well-being. We all have this attitude or belief that we need to be “hard-core” and that the definition of “hard-core” involves pushing yourself to your physical and emotional limits. We say things like “good luck getting sleep at camp” or “sleep is for the weak”, and I’ve seen people more or less ridicule others for wanting to stay healthy while living/ working at camp. I used to be one of the one’s running around “pushing through” or “sucking it up” and saying things like “I don’t need sleep, I’ll sleep when I’m dead” it was the culture I was indoctrinated into. And then we wondered why we would burn out half way through the summer, or crash at the end. So I’m calling a time out. 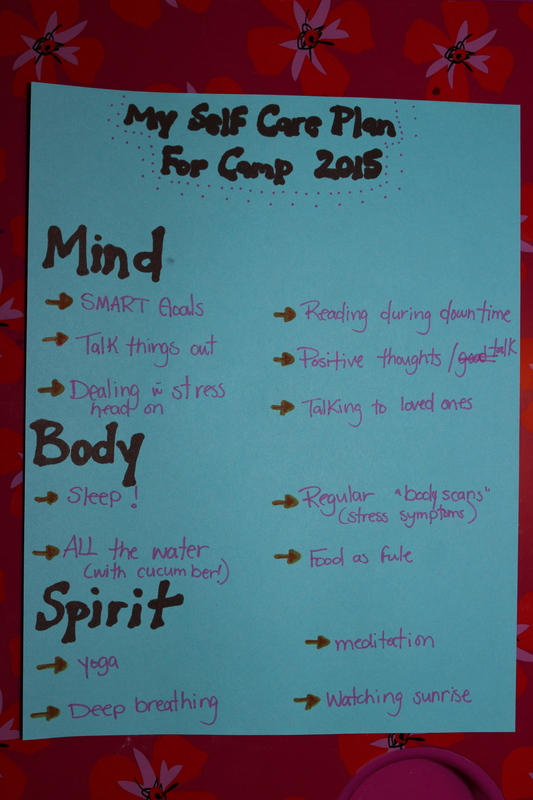 I think that while it’s important that we manage our expectations about camp life (it won’t be just like home, chances are, we won’t always get as much sleep as we would like, or we might choose the snickers bar over the carrot sticks when we’re grabbing a snack on the go) we also need to embrace and encourage our colleagues to practice self-care, because it’s really hard to care for others when you don’t feel your best. To get applicants in the mind-set of making their physical, emotional, and mental health a priority. 3. We tried to be role models for our staff. If I’m being honest, this is by far the hardest one. Last summer for the first time in my camping career I decided that I didn’t need to be around every second of the day. I decided that I deserved an hour off once a day, so I started taking an hour after dinner, once the evening program had begun to just go to my cottage and be by myself. I didn’t make it every day, some weeks I was lucky to get there once or twice. But MAN did it make a difference. I felt calmer, happier, and I’m sure I was nicer to be around because, as it turns out, I’m an introvert (took me long enough to figure that out!) I’m a very outgoing introvert, but an introvert none the less. So I need time alone to recharge. And sometimes an hour, or five minutes is all it takes. Role modelling healthy behaviours is challenging but certainly worth it because it allows others to take care of themselves too. Here’s a really easy activity to do with your staff. Have them section off a piece of paper into areas for their mind, body, & spirit . Then ask them to fill in ways they can care for themselves in these areas. Here’s an easy way to get your staff thinking about their own self care. Last summer was the first time I really made an effort to make these changes at camp, and it made a difference. I didn’t see that huge mid summer slump that I’ve seen in the past and I didn’t FEEL the mid summer slump the way I’ve felt it in the past. It could just be that I happened to have a really wonderful team, but I found the staff were kinder to each other and had more energy than other years. I really wish that I had figured this out years ago (it’s such a simple concept, take care of yourself first, to take care of others better) but now that I have, I’m not looking back. 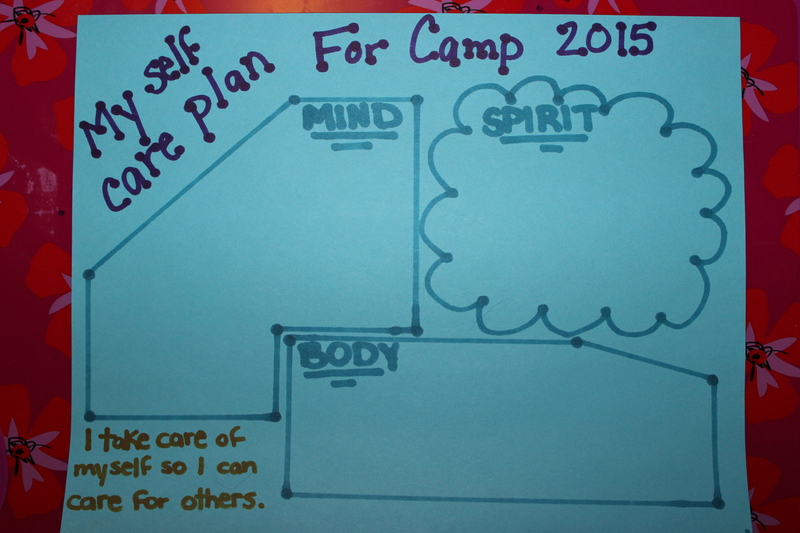 And I hope that you too will take care of yourself and help change the culture of camp to one where we see the value in self-care. 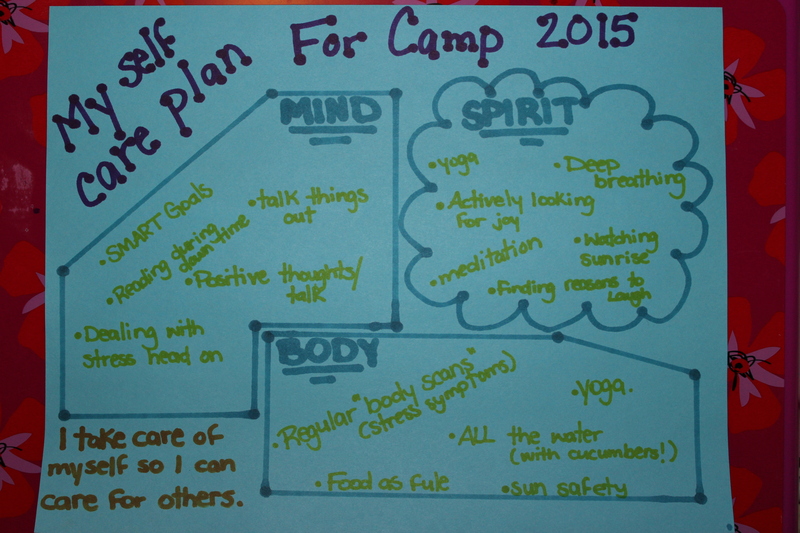 How do you practice self-care at camp? Tell me about it in the comment section below.